Thank you once again! We've had an incredible time working with you so far, and look forward to the journey ahead! Alex Darant, Kitty Elliott, and 121 more people like this update. Yay, can't wait to see the game! @Wayforward. You got the hyperlink wrong. If you click on "wayforward.com" you are sent to "wayforwrd.com" Also you have to give more emphasis in front page that you are still receiving pledges for more goals. Man that stream was so great, between hitting, the 800k goal in the last half-hour, Spanky Joe and all of the "Thans". I really hope Wayforward has a similar stream on the last day or so they are accepting paypal donations so we can make sure we hit at least a couple of the other stretch goals. Really want that VA goal,or at least the hero mode, I mean we were already a tenth of the way to hero mode at the end of the stream. Thanks for everything guys, but hopefully the best is yet to come. Congratulations! Shantae is one of the best platformers I've seen for a long time. Good story and great characters. I wished that we had also reached the Hero Mode. Would have been cool also to play with Bolo or Sky. But maybe this will be possible to a later point. It is a good thing that this game will be also available on PC. Accepting donations after the pledge is over? Giving backer rewards to late donations? Using this source of income to further develop the game? You're leaving the door wide open to be as inclusive as possible while simultaneously giving as much dedication to the product as possible. I have to say, if this is how WayForward always operates then I might have a new favorite developer. To be fair, I'm pretty sure WayForward has already incorporated those expenses into their calculations. I reaallllly hope that the 900,000 goal gets hit- It would be awesome to play as other characters! Half-Genie Hero will be an HD game, so it will not be getting a 3DS version. But the 3DS will be getting its own Shantae game, Shantae and the Pirate's Curse. Perhaps leading up to its release, WayForward can remind fans that if they enjoy the game, to contribute to Paypal for Half-Genie Hero for their other consoles. How long will the Paypal be open? Bills look tight this month until mid-November. I hope Kickstarter goes easy on Wayforward by not taking too much money! I know that Kickstarter takes a small share of the amount from this successful kickstarter campaign. So even though we have raised over $811k dollars, I wonder how much the REAL total is after kickstarter takes their share. Other than that, CONGRATS WAYFORWARD! Now even though we didn't reach a million dollars, we have to admit we did a damn good job since this is Wayforward FIRST Kickstarter campaign! I think this was a VERY successful kickstarter campaign because not everyone knows about Shantae and not everyone has heard of Wayforward BUT one thing for sure is that if Wayforward does another kickstarter in the future, it will be even more successful than this one! For now, let's get working on Shantae! Let's spread the word and tell everyone to download the Shantae Game Boy Color game AND the DSiware version as well! Those two games can help new Shantae fans catch up and it will help die hard Shantae fans cope with the wait for the new Shantae games! I can't wait for the 3DS Eshop version coming this winter! I can wait to get the game when it comes out. It will be the greatest thing :) Thanks WayFoward for a great series and to the donors for the support of this game. Congratulations to WayForward for getting even this far! While it may be a lot to hope for to raise the half a million required to nail all the stretch goals, I do nonetheless hope you'll reach as many as you can with the coming paypal donations. 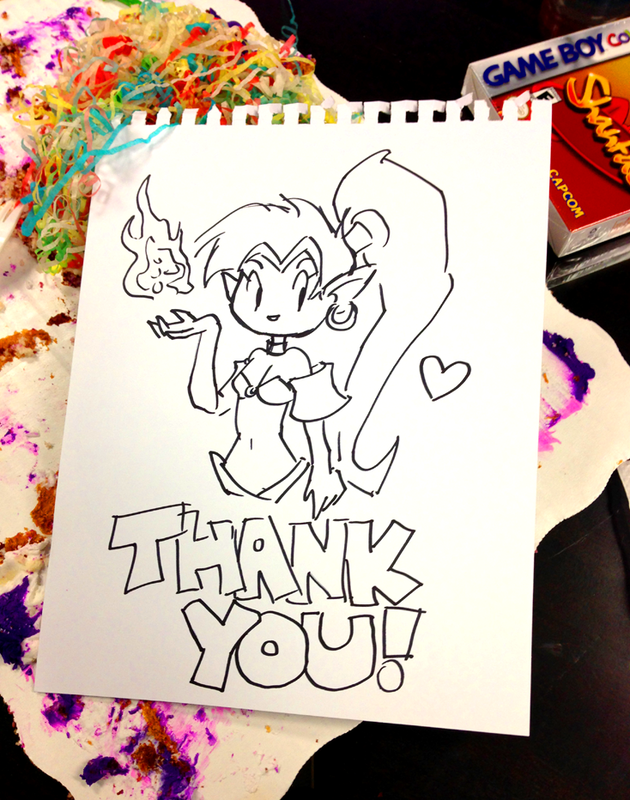 Looking forward to all the Shantae-goodness to come! Actually Winson I've been crunching the numbers and if everyone below the 60 dollar mark were to up their pledge (over time if they can't afford it upfront) like you did then the total funding for 1/2 Genie Hero would be 1354609. And thats NOT including the pledges from Paypal. Hope that puts things into perspective. There is nothing to feel bad about in donating any kind of money to a kickstarter project given the risks involved. Taking that first step to even drop any small amount of money is, in and of itself, a HUGE gesture. But if people are feeling generous, now that the games funding is official and all that, consider upgrading to that tinker bat tier status and 1/2 Genie Hero will reach 1.3 mil in no time at all. ;) Just some food for thought for the community. Can you make a Stretch Goal at $1.4 million as "Nintendo 3DS Version"? At least get people to reach for that goal. If we can't we are not losing anything. If we do reach it, we get a Nintendo 3DS Version of this game as well as others, and you get $600,000 more funding, and it'd end up a Win/Win situation. Phone auto corrected name Winson. All I know is, this coming year is going to be very interesting and fun. Congrats, WayForward! Now just keep pushing the PayPal pledging (as I will) so we can reach that final goal together! @Winston, I did the same but at least we were able to reach some stretch goals because truth be told, it was looking like it was barely gonna be funded with so many good projects and M#9 getting more love. Despite raising my pledge from $35 to $60 and making me pledge more money to this than to Mighty No. 9, the fact that we couldn't get them to 1.3 million makes me feel like I've failed them. Congrats!! I'm proud to donate and to help out. Awesome job guys! Was wondering if it isnt too much trouble would you guys consider doing a secondary pallet swap similar to the blue genie costume for Shantae, only this time make it a Nega-Shantae pallete swap. I know there are hopes to get to the stretch goal chapter in which Nega-Shantae makes a reappearance but if we were unable to make that goal how fun would it be to have her their in spirit as an alternate costume for Shantae? ;) Good luck on the game I cant wait till next year! Gonna be hype! It was a pleasure to help you guys out,hope to see the project become a great success,and congratulations on making it this far! Caketae/Shancake looked yummy. I hope you guys didn't overdo it. By the end of the stream you seemed well worn out. Take it easy this weekend, OK? Let's hope the paypal option works out, I'd love to see more stretchgoals with that "Funded" tag. You can help reach the other stretch goals by donating to their PayPal, that will fund the remaining stretch goals so they can be put in the game. @Hyper Then they would have to redo the whole game. This game is for the Vita, consoles, and PC. @ Klink I only see that happening if Wayforward suddenly announces they bring this to 3DS too. Then that kind of funding may happen. Is there a way for us to hear about the Paypal contributions in the coming months? Is it bad that I still have faith that in the coming months, the Paypal donations will be able to make up the final 500,000 dollars to reach all the stretch goals? Keeping the Paypal pledges open for a few months huh? Actually this is great for me. That means I might be able to put in an extra pledge or two. I pretty much murdered my wallet/credit card/finances for the month by doing multiple pledges on Mighty No 9. I can see the additional missions definitely becoming dlc but is disappointing the voice acting and animated sequences didn't make it. Hey Christie, it's very possible we'll have her playable depending on Paypal activity in the next months. I really hope they manage to get the other stretch goals because that last chapter looks techlicious. sad we wont be seeing playable rootytops. Thanks for the update. How long will the paypal store be open for? I'd be nice to get some add ons later on when I'm not so broke. I was so worried when I came back home, checked my email that the payment failed, quickly changed credit cards, and now it's all well and good! Congrats on the milestones wayforward! Can't wait to receive the goods! Is this game coming to 3DS?